3) The Next Real Estate Bubble: Will Another Bring Down the US Economy? 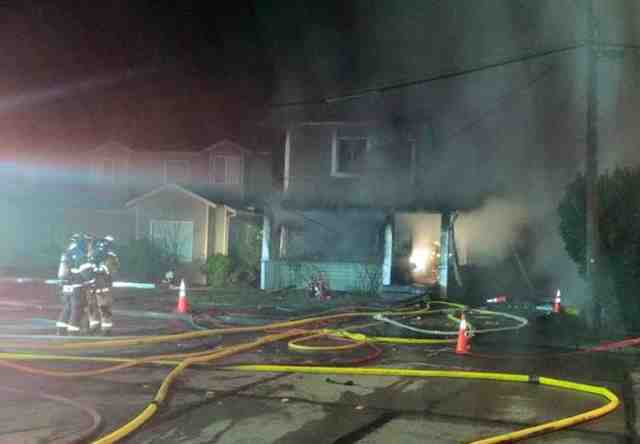 One person died in a Renton house fire Friday night, according to the Renton Fire department. 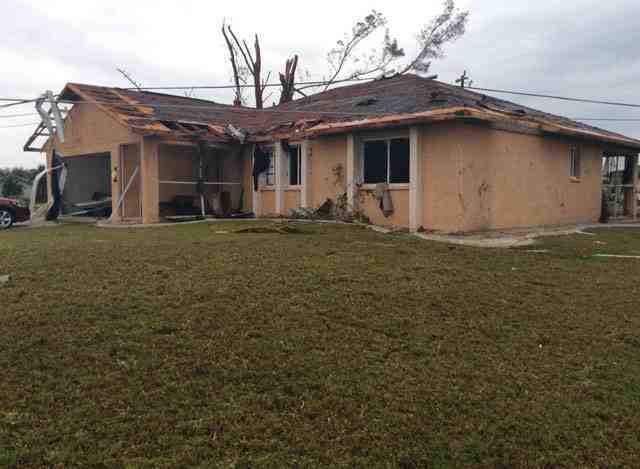 According to the NWS preliminary report, the tornado lasted just seven minutes and was on the ground for 3.4 miles. It damaged 178 structures, destroying one home and leaving 14 with major damage. More than 100 power poles were knocked down. ⇧ The Next Real Estate Bubble: Will Another Bring Down the U.S. Economy? ... the fact that rents are expensive doesn't necessarily mean that "rents are in a bubble." In fact, it's difficult to imagine what, exactly, a "rent bubble" would look like. If rents were really in a bubble, it wouldn't make sense that household formations were up so much in recent months. There's no justification for paying bubble prices for rents, since renters can't gain from asset appreciation. A rational renter would double up with friends and family members and wait for those prices to come down. But instead, Americans have been forming new households of their own, after years in which this behavior was depressed by a weak economy and job market. constraints—such as a lack of attractive, buildable land and skilled workers—and are having trouble ramping up production to meet demand. This would explain why house prices are high while actual home-sale volume and new single-family home construction is low. I disagree with Mark Hanson's analysis, though I agree with his idea that 20%+ down is sensible. The issue I have concerns the "unorthodox" capital notion. The institutional buyers had the cash-raising ability so they could easily replace family buyers who were crushed by the housing crash. We aren't in a housing bubble. We're in housing-scarcity mode. Until incomes go up enough to force up demand enough, there's no reason to fear a general bubble forming. The current political climate is not conducive to the system suddenly becoming compassionate and intelligent enough to house the entire population as it could be housed (and without forming a bubble anyway). 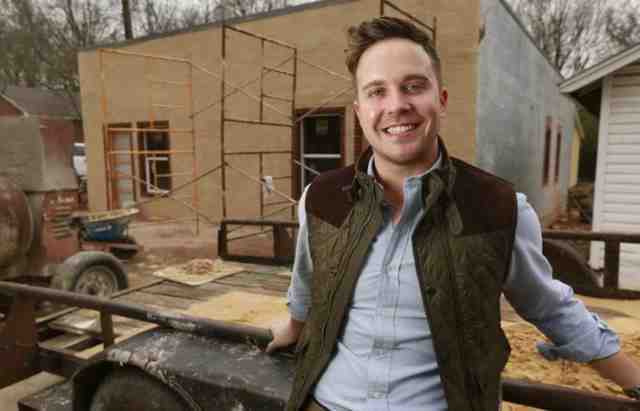 This is a nice story by Zack Orsborn about a young man (Chris Rakestraw) who's made a good go of it in small-scale, residential real-estate renovations. The takeaway seems to be that Chris loves what he does. He loves his work. All other things being equal, lowering taxes is generally a race to the bottom. Among the reasons for this paradox is the elusive concept of "capital formation": a shorthand for genuine wealth creation. This list was compiled by Robert Jenkins, formerly a member of the Bank of England's Financial Policy Committee and now Adjunct Professor of Finance, London Business School and Senior Fellow at Better Markets, and first delivered at the Finance Watch conference "Confidence, ethics, and incentives in the financial sector" on 17 November 2015. How many of the banks involved lost their banking license? How many of the top executives of the banks have been prosecuted? Why do so many poor people go to jail and so many rich ones not and even though the crimes of the superrich are astronomically worse? The superrich own the system. It's not truly democratic. We live in a plutocracy. It's terrible risk management. It's bad business. Well, should I say, "Duh"? U.S. apartment rents posted one of the weakest fourth quarters since the end of the most recent recession, according to the latest analysis of the U.S. multifamily market by CoStar Group. My guess is that it is not a consequence of construction but rather landlord and management fears about the global economy and its potential slowing impact on the US economy. Owners and managers see the lowering unemployment rate but also see wages still not keeping pace with even low inflation. They know about the many other negatives, such as student debts and the Fed raising rates possibly prematurely. If something does go wrong, the usual buffers in the global economy look to be weakened or nonexistent right now. Government deficits are high in much of the world, and even where they aren't, political leaders have shown no desire to open the spending floodgates in an effort to bolster economies. If the American economy were to slump and President Obama were to ask the Republican Congress for fiscal stimulus, it would give new meaning to "Dead on Arrival." It would also mean the US would slump into the worst depression in its history. This is why lowering taxes is a race to the bottom. 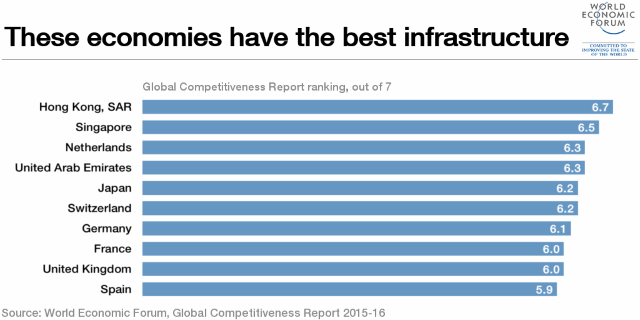 Well developed infrastructure is a critical factor underpinning economic growth and strength. Effective transport, power and communications networks create the conditions for businesses to grow and the wider economy to function effectively. Now, if you think that all infrastructure ought to be privately owned and used only upon the payment of user fees, well, we're living in different universes. We need in underlying infrastructure so that everyone will have a basis upon which to develop. Someone who is broke and without assistance wouldn't be able to pay the user fee to even get to a job opening. That's just the beginning. ... ideas tend to advance and retreat slowly, like glaciers, not precipitously, like armies. But replace the names of the leading economists with products in any other market — cars, for example, or semi-conductors — and most people probably would agree that the RePEc ranking looks like a closed, inefficient market with high entry barriers. Might the world's leading economists be so keen to protect their own ideas that they ignore (or, worse, stifle) innovation from unexpected quarters? For a group of people so committed to free markets and so enamored of "creative destruction," that is a question that urgently needs to be addressed. The answer may hold enormous implications not only for intellectual growth, but also for human welfare. That is such a polite understatement. There's plenty to think about from this article by Dalene Bartholomew. I'll add that you want your employees to understand and to appreciate how costly to all of them each claim is. No claim is paid in isolation. Every claim is part of the overall cost that ripples not just through the organization but the entire economy. Fraud is unethical. People who commit fraud typically do not make good fellow employees. If they cheat the carrier and the employer, they could cheat other employees very directly and not just via false workers-comp claims. 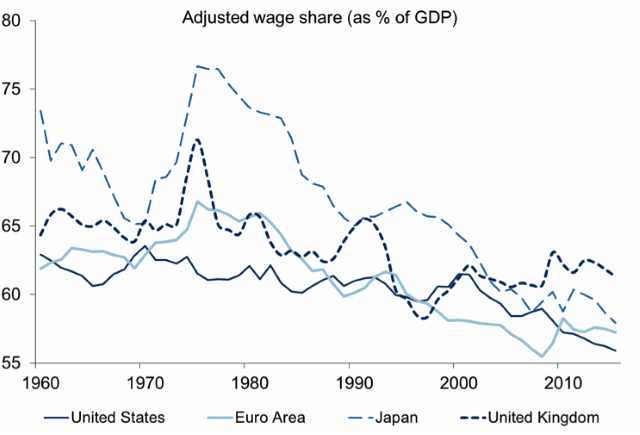 A) During the last decades, the labor share has declined (graph 1). Source. This leads to lower household consumption. "It's beginning to look like a bubble in the making. Historically, real estate got in trouble where there was overbuilding, overleverage or both," Mr. Leary said. While leverage is creeping up, there's not much overbuilding. This time it's a different kind of bubble, he said. "I don't think it's a bubble that will immediately explode, but there is a bubble in manager promises and client expectations," Mr. Leary said. "There's little room for error." With all due respect to Russia, Russia's Finance Minister, Anton Siluanov, is either a 1980's-style-neoliberal dupe (who hasn't a clue how to handle and fix Russia's economic and financial ills) or he's a shill for that very misguided neoliberalism. Vladimir Putin has openly stated that one of his main goals is to move Russia toward greater and greater autarky (national self-sufficiency). It is not necessary to borrow to accomplish that or to deplete Russian "reserves" or to reduce government spending or fear price inflation. Issue the necessary rubles without engaging in any borrowing. Target the money directly at the proper projects to increase Russia's ability to supply what Russia has been importing. Issue and tax away the money exactly so the people will be able to afford to absorb the supply at desired price levels. In other words, control inflation and deflation via matching the money supply to the projects non-speculative needs and in accordance with the velocity of the money's circulation. That control can be, and should be, done in real time. It will take time to ramp up, but it's definitely doable. The sooner Russia starts, the better. "We are seeking to understand the risk that corrupt foreign officials, or transnational criminals, may be using premium U.S. real estate to secretly invest millions in dirty money," FinCen Director Jennifer Shasky Calvery said in a statement. Both New York and Miami are popular with wealthy foreign buyers. Alberta's woes will weigh on the national market. But Mr. Soper also expects the sizzling markets of Toronto and Vancouver to lose some steam this year. Home prices should increase 5.5 per cent in Greater Toronto and 9 per cent in Greater Vancouver, well below last year's levels as buyers get pushed to the sidelines by a lack of affordable options. "While most of the country will continue to see house value appreciation in 2016, we expect that the pace of price increases in Greater Vancouver and the Greater Toronto Area — where real estate appreciation has significantly outpaced job and wage growth — will settle to a more sustainable, single-digit price increase trajectory," Soper said in a statement. Is Fannie Mae lowering lending-standards too much? "These loans are insane. The default rate is going to be through the roof!" "Doesn't matter. The guidelines are the guidelines and we're going to make a fortune." What happened to the real estate market when a huge number of borrowers, who had competed with one another to drive up housing prices to record levels, stopped making payments on loans they never should have received? Exactly. The bottom fell out. What will happen to the real estate market when a huge number of borrowers, who will be competing with one another and driving up housing prices, stop making payments on loans they never should have received? Are enough people going to be able to use the lower standards to cause a crash? Are enough people going to be ignorant enough to take out reckless loans? Eventually, the Great Recession's causes will fade. Young people will come up who won't remember the lessons. Is Fannie Mae banking on that already? Who's behind this? Is it government or Wall Street types or both? 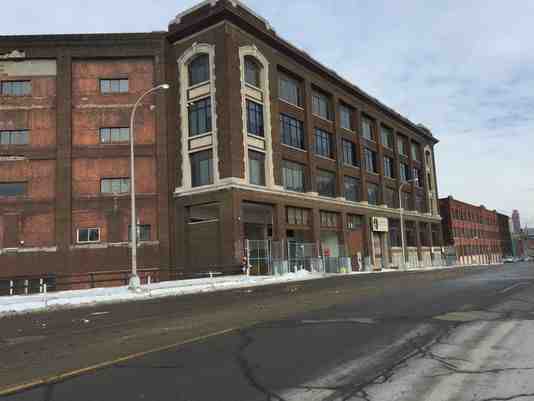 Dan Gilbert's real estate activities in Detroit remain fascinating. The positive trend ought to continue throughout 2016 for all three sectors of the commercial real estate market, said Jessica Ostermick, director of research and analysis for CBRE in Denver. Industrial, office and retail all saw lease rates increase in 2015. The attractiveness of Denver's labor market continues to drive demand for office space, said Alex Hammerstein, senior vice president with CBRE's Occupier Services Group. "It was another strong year. We're seeing rates go up, we're seeing new construction, we're seeing activity from grocers, restaurants, a variety of different retail users expanding, we're seeing the new housing construction," Lee said. "Retailers love to see new houses coming in. That will help spur more development." Here's Fannie Mae's Chief Economist, Doug Duncan, saying at the end of the video part of why I questioned above whether lower lending standards will be enough to cause another crash any time soon: there may not be enough low-price houses out there yet. A Decatur man and his female sidekick have been posing as real estate agents and ripping off prospective home renters in Gwinnett County and elsewhere in metro Atlanta, police say. 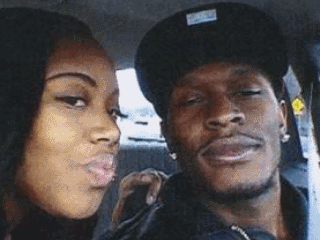 Gwinnett authorities are looking for information about the pair, who, according to a police news release, have been finding vacant-home listings on the internet, then creating their own, fake listings advertising the homes at affordable prices.